Just to have it here, too. So, the big question is wtf is this song doing on Zabathôr’s playlist. Zabathôr is all about big dreams and big success. Somehow, beneath Mordor’s tutelage he grew to translate force and power into the force and power of one’s belief in the possibility of success. Perhaps because he always felt very spiritual in relation to his magic even though he understood it was manipulation of the physical. His ability to manipulate his words to convince others to side with his cause comes in part from his true sincerity in his belief of his own words, as well. He creates dreams for others and convinces them that all they need to do to see them through is wake up. Also, the soothing, lullaby tone of this song reminds me of the tone he sets when he woos those around him. Sweet, charming, motherly. Come, child, I will make it all right. Zabathôr loves fire. It’s pretty and hot and is easily too powerful to control. But he can control it. Seriously, though, picture Zabathôr walking into frame with flames all around him, his hands out to his sides as his palms and fingers burn, with the intro of this song in the background. Oh, the grand, scheming, charismatic, bad guy. Zabathôr needs you for his army (of slaves) and sends you smooches. But he thinks you’re a dumbass. Zabathôr always wanted his own little army of undead that would be completely under his control. They would wreck havoc and then drink until the ground beneath them was stained red with wine. Who doesn’t like to party? And bleed? I mean, every party has to have blood, otherwise it just isn’t a party. Zab would totally be jammin’ to this as he tortured someone. He’d even stop to headbang to the chorus. On a more serious note, however, underlying the fun times, Zabathôr feels like the puts quite a bit into keeping the Four Lords whole. It might not be physical, but at times, he feels drained by their efforts and the lies. Zabathôr has never lived for another person in his life. He’s never taken a moment to look past what he thinks he knows is right. Lately, something has changed that and this song has dual meaning for him. First and foremost, he is beckoning for Pharazanû to join him in the grand success he sees for the Four Lords. He knows it is against Pharazanû’s nature and it is very difficult for the younger man to “walk with [him]…to the forest of denial.” He hopes that eventually, he will be all right. On the other hand, Zabathôr is looking at himself and his role in creating the forest itself. He’s finding himself split and is having to face himself for the first time through the eyes of a different sort of soul. One that is usually a victim of one like him. Um. Hard to explain without giving away too much. Will update. >.> Nothing to see here now, though. Move on. Move on. This might seem just as odd as A Dream is a Wish Your Heart Makes. So first, some context. Forest fires are normally a natural part of nature that cleanse and allow regrowth like prairie fires. But human interference, negligence, and construction have turned them into something unnatural. Their destruction can be devastating. I hear this song as the confrontation between humans and nature. In this song, a forest fire in California looms. Nature fans the fire and everything seems to go against the humans. Things look bleak. But the juxtaposition of the little girl laughing and dancing “through a field of graves” sort of sums it up for me. The destruction is needed. Natural. And everything would be all right. This is from Zabathôr’s childhood. I picture little kid Zab standing in a field of destruction, smoke, and ash, and having to process that. Having to get beyond it if when it burns away, it doesn’t regrow. I hear him telling himself that everything will be all right given time just like this song does. If only the rain would come. This is a glimpse into the future and the past. Zabathôr has lacked emotions for so very long as a survival mechanism. He’s on the cusp of greatness. What is he willing to sacrifice to get there…? While this seems like a troll song, I actually think it captures Zabathôr’s charming, irreverent attitude toward many things. And he has that peppy cheerfulness, as well. Of course, it doesn’t capture the cruel seductive side of him. Anya is growing up. Though she’s in her early twenties, she’s been so sheltered that it seems like only now is she learning about the world around her. It’s her bildungsroman and though she started out alone, she landed in Bree and luckily, there she found people who are teaching her how to fly. This is Anya’s main Morty song. She knows that she only gets stolen moments and that there are hidden secrets between them. But when she’s with him, it is all she needs. Every verse echoes their relationship to me. Death is rattling the cage/Like a bird that would escape/But there’s no room for thoughts like these/In the garden where we sleep… Come on. It says death. And I am on a burning ship/Clothes all flying in the wind/But I am beautiful like this/When you hold me in your hands… Something about their love feels like it can only end in a tragic ending, but she feels more beautiful because of that tragedy. Always searching for those breasts, pumping morphine…Don’t you fly to them, you can fly to me… She’s pleading him to only choose her, though she knows it’s in vain. I’ll take the moment in my hands/Pull it open ‘til it sings/Before the motion of this place/Where nothing stops to have a name/Will leave us hanging like a tear… Anya savors every moment she has with Morty. She doesn’t know what it is and knows that it will end in tears, but she will live in the moment with him while she can. Anya’s pining song for Morty. She is very much Sally in that she’s wiser than some give her credit for, but she lacks the full confidence to fully be heard. Her persistence, like Sally’s, brought her to Jack. I mean Morty. Ludo is awesome and all my playlists have a Ludo song (except for Zab’s, I think). Just listen to the lyrics. Only, they don’t really like eat each other. Not like that, at least. I think this song captures Anya’s intensity in her feelings for Morty, though, in all seriousness. She and he are one in her eyes and nothing can end that. Wow, guess what! Another Morty reference! This was certainly from when they were still doing the cat and mouse chase. Morty’s big line was something to the effect that he’d ruin her and broken and not good enough or something and she was like, SO? Who is, really? Another, ahem, Morty song from before they got together. Anya smiles the good smile regarding Morty’s reputation and the fact he’s got others. And she is actually fine with it only because it allows her to be with him as well. But she has her moments when she gets jealous or upset. Anya’s not that good at choosing compatible mates. That aren’t dead. I feel like this is pretty self-explanatory and can also be a Cwen song. You know what, this one would be better for Lina. I’m moving it to hers. So there. Anya is such a romantic. She truly believes in soulmates and fate bringing two people together and all that shtuff. Faethril and Aeron’s subplot is supposed to support this in her (harhar) and I hope it does so accordingly. 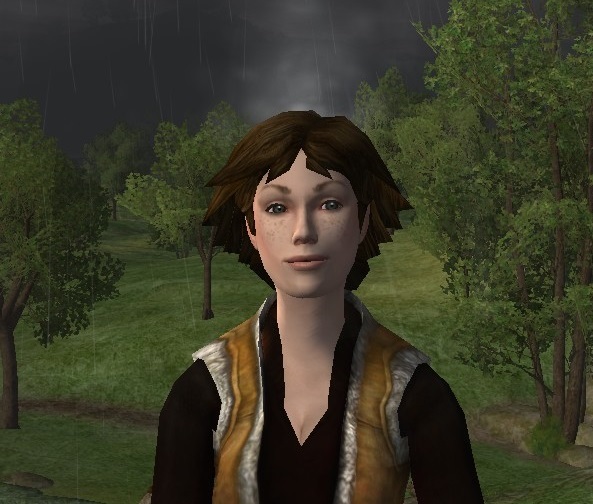 When she finally took off from Dale, the world was an alternate reality and she often felt like a ghost walking among the folk of Bree. Yet, she started to find her voice and grew into her tragedy. In addition to this, so often Anya feels let down by people. She’s rather optimistic and believes in the possibility of good in the world, so this can be hard for her. Anric? Morty? Canderas? All of the above? I think this was first added when she tried to give it a real go with Anric and she chose to let Morty go. She loved Morty so much, but knew she couldn’t keep him, et cetera, et cetera. When Anya was learning how to get by in the real world, she learned this stuff the hard way. She was incredibly gullible and if she hadn’t run into Morty and Eruviel first thing, who knew what would have happened to her. The small, dissatisfied part of her feels exactly this way. Anya’s biggest fear is being alone with no one to remember her or love her. For a long time, I didn’t know why this was an Anya song. But I think it’s for Anric. She has such complicated feelings for Anric. She truly did love him, but when he left her so she could choose without the pressure of his desires, she felt like she left him because she wasn’t good enough. She felt like the fact she still loved Morty was something wrong with her. This is a plea to Morty to save his best love for her. And she secretly hopes he feels the same way in that he hopes she’ll save her love for him. This is my comic song in reference to Anya’s predicament with Faethril and Aeron taking residence in her brain. She doesn’t need cocaine, though. I really enjoy this dude’s cover of Fatatsu no Kodou to Akai Tsumi even though its not the entire song. It fits, though. You can get a different version of the full lyrics here. Been trying to write Cwen’s goodbye to Durrow for about a week now. It’s two sentences long, though I have a lovely screenshot. Clearly, it’s not going so well. This post a while back that featured Passenger’s Let Her Go was Cwen’s song that was mainly related to Oendir. Today, here is a song for Rheb. The start of their relationship was just a one night stand for Cwen; when pain and longing turn into comfort and warmth, is it just as genuine a love? Sam Smith’s original is beautiful, but Ed Sheeran is better. Because he’s Ed Sheeran. I don’t want you to leave; can you hold my hand? isn’t really all that emotional. So I paused my work and clicked over to the YouTube tab and restarted the song that was playing. I don’t listen to a lot of radio, nor do I expose myself to a lot of random music on internet or app stations, so I had never actively heard “Let Her Go” by Passenger, and that was the song. So, I drank some hot tea and focused the feels into this blog post, and now I can share the feels with you.